If I don't have a menu for the week - I won't stay on track. As long as I have a plan, we are good! 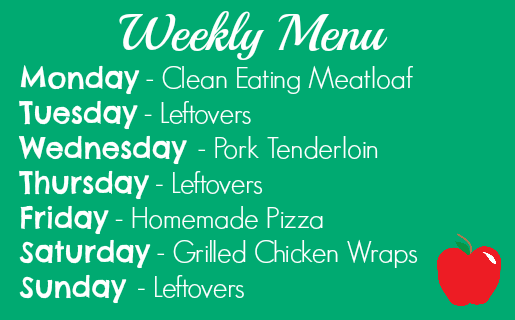 I try to make my menu for a week or so at a time so I can make sure I can get what we need and thaw things out in time. It also helps me budget, because I buy what I need for the menu. Sometimes things get mixed around or we end up needing more or less - but I at least know what I have on hand to make. I realized that leftover nights are wonderful! Cook once and eat twice - YES! Sides for dinner are usually some kind of veggie that I can fix up quickly. Check out the recipes: Clean Eating Meatloaf - this was great with corn on the cob and pinto beans! Homemade Pizza - this is going to be a fun Friday night activity. Grilled Chicken Wraps - grilled chicken, spinach, tomato, and hummus in a whole wheat wrap or pita. Pork Tenderloin - I am literally just baking a tenderloin with some seasoning on it. We'll have sweet potatoes and salad as our sides.